After you decide on how you want your dorm room decor to look, your first concern is dorm safety and dorm security. You don't want to spend more time in your college courses thinking about your valuables and cash in your dorm room than you are thinking about your college courses. You want to have peace of mind that your valuable dorm items are safe while you're in class. Have peace of mind and extra dorm security with a dorm safe such as our Diversion Safe Hawaiian Punch Can. 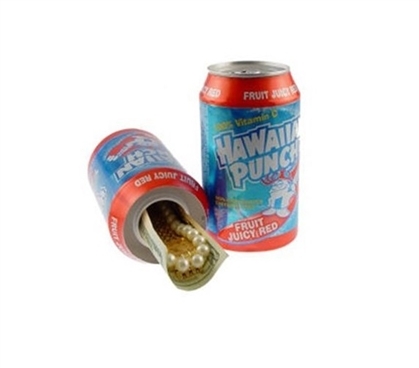 Our Diversion Safe Hawaiian Punch Can is an unsuspecting dorm safe. Simply keep this dorm essentials item on your dorm floor in your college closet or in your dorm desk among your other cans of pop. The inside of this dorm supplies item is hollowed out so you can keep bracelets, cash, and other valuable items in an unsuspecting place that blends in with your other dorm essentials. Of course, you'll be making sure your dorm door is locked when you're not in the room, however you'll want to make sure you have extra peace of mind and a dorm safe for the small dorm items that mean the most to you with our Hawaiian Punch Diversion Dorm Safe.